Like I said, I’m super into breakfast these days, I’m even more into make ahead breakfasts with minimal clean up. I love sweets, and I usually like to have a little something sweet with breakfast whether that be honey on toast, fruit or some chocolate in my oats! 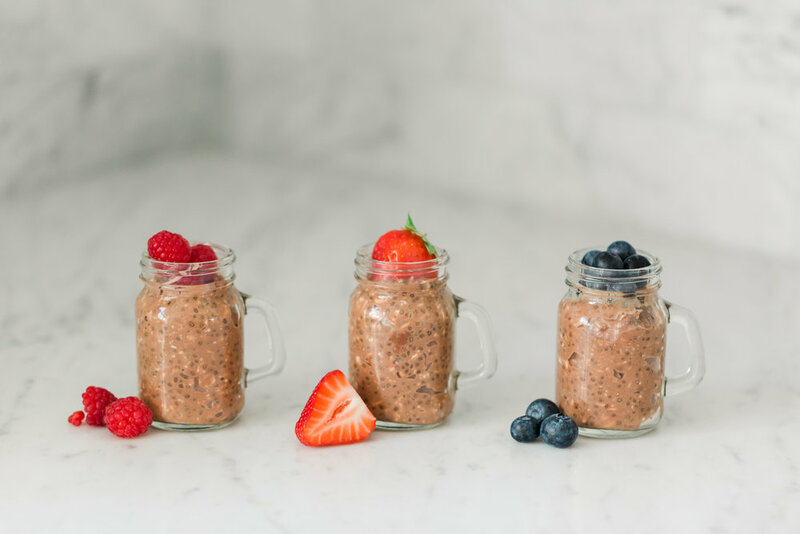 These are so simple to make, you place all the ingredients in a jar the night before, shake and wake up to the creamiest, most flavorful overnight oats on the planet. Okay, maybe there are some better ones out there, but I highly doubt it, and I know they’re not as healthy as these bad boys! These oats are packed with antioxidants and superfoods so you don’t have to feel guilty having chocolate for breakfast, and that’s a win in my book! Make these and top them with anything you like, I love a nice tart fruit. You really can’t beat the flavor or texture of these bad boys, you’ll feel like you’re having dessert for breakfast! Place all ingredients in a mason jar. Fill remainder of jar with unsweetened coconut milk, shake and place in fridge. Top with your favorite berries or granola, add chopped nuts and a drizzle of honey or maple, or grab a spoon and dig in. If you like dessert for breakfast than this one is for you! It should maybe be called pudding instead of oats. It’s just real good and chalk full of good things for you! This recipe was born because I was sick of protein shakes in the morning but still wanted to find a way to get that protein in first thing. I happened to have all of these ingredients in my cabinet years ago and it turned out it makes one delicious concoction. If you’re feeling like you want a little added sweetness or serving it for brunch and want to really wow people top it with my maple coconut whipped cream. I mean that stuff is really just good on anything! !